﻿﻿A bear is a bear no matter where it’s found, right? Not so. As human development continues to expand into wild areas and non-natural food sources stay readily available “urban wildlife” becomes a bigger and bigger issue that is taking centre stage in many communities. While to many, the black bear that has been raiding the local fruit trees & garbage cans looks no different than its counterpart foraging on berries in the backwoods; you may be surprised to know that ‘city bears’ become quite a different animal altogether. The most obvious difference in behaviour is described in the terms “habituation” and/ or food conditioned. Constant interaction with humans and human-related environments reduces a bear’s natural wariness of people. If this tolerance (habituation) is combined with the opportunity for obtaining garbage a much larger problem presents itself. Habituation coinciding with food conditioning leads to advanced behaviour such as bears on patio decks, breaking down fences, attempting to enter buildings, vehicles etc... Simply put, the bears get used to us and bolder in their attempts to access easy meals from garbage cans, fruit trees, bird-feeders and so on. As a consequence the risk to public safety and property damage increases and the bears are more likely to be destroyed. Other traits set urban bears apart as well. Research has shown that urban bears may become overweight, re­produce at an earlier age, produce larger litters with higher survival rates, and reduce their home ranges up to 70%-90%. Food conditioned female bears teach their cubs to forage on garbage and the cycle is perpetuated; creating generation after generation of food-conditioned bears. Removing bears from the city by means of relocation, translocation or euthanization are reactive measures proven ineffective as management tools. Bears will continue to find their way into our communities and become potential threat to humans or human property which in turn generates the need to respond to public safety. Bears are then destroyed or removed from the community leaving no incentive for human behavioural change. Again the cycle continues. Humans carry a responsibility towards wildlife especially as towns & cities continue to grow and develop prime habitat. Conscientious planning, proactive measures and collaboration can stop the cycle of negative interactions with bears and other wildlife including cougars, wolves & deer. Urban bears live hard, die young. Make a difference - join the effort to make your community “Bear Smart” and stop human-wildlife conflict before it begins. 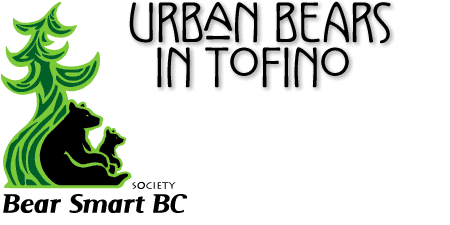 Tofino Bear Smart Society: Urban Bears in Tofino and the dangers of habituation and interaction with locals and visitors to Tofino.